Lisa Marie Rasmussen was born in Wisconsin and finds her ancestral roots in Scandinavia, Germany and Ireland. Lisa remains eternally grateful to her late mother, "Mickey," who cultivated her creativity and imagination, and who immersed her into the world of art. Her mother provided her with unyielding support, encouragement and inspiration. In addition, she taught her daughter to see that we are one with the natural world, a lesson that remains central to Lisa's work. Lisa's creative process begins with the premise that we are connected to the universe. Through her art, she attempts to portray how the universe "speaks and dances in my eyes and in my soul." 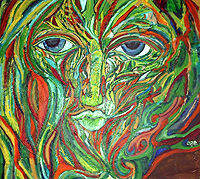 Her art is an expression of her core of being and her constant evolution. 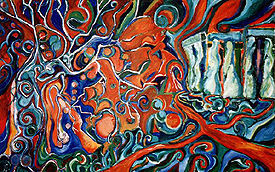 It taps into archetypal energies and engages the viewer into a surreal landscape of discovery. Much of Lisa's art has been inspired by dreams. She finds that her dreams take upon new dimensions when she places them on canvas. Her paintings have enabled her to gained layers of "aha's" as well as elicit "aha's" within others. Her art has also been inspired by transcendental experiences she has had during pilgrimages to sacred places around the globe. Such sites include the temples and mountains of Nepal, the catacombs of Peru, and the rainforest of Costa Rica. Her vision is to continue to travel to sacred places and to help and guide those who wish to tap into their divine creative spirits. She hopes to inspire others to create and to become a light that helps persons realize our connection to each other, to all creatures and beings, to the universe and to the divine. Lisa presently resides in the San Francisco Bay Area where she lives with her true loves - Griffen, Maya and Paulo - her cats. This piece is a surreal landscape about my visit to the sacred ruins of Stonehenge - my rediscovery and fascination with the Pagan connection to the universe. Red symbolizes the life force - the stones in green symbolize the creative element. Bodies and entities are intertwined within the composition. The power of this piece is its expression. It is truly a passionate piece. This resides in the permanent collection of the artist. The Green Man. He is the masculine force of the land. He is the enchanter. His power is seduction. His eyes want to meet. My journey to those mountains was one of healing. I had come to spread my recently deceased mother's ashes into the sacred landscape. I came with a tour group of 14 people. We hiked through the mountains each day. On the day of the most difficult climb, I fell terribly ill. I thought I was going to die. But I got through it. The next day, I felt rejuvenated. I saw the sun rise, and I embraced the beauty of the morning. I felt like I had died the night before, and that I had been reborn. I knew in my heart that this was the right day to spread my mother's ashes. After breakfast, we began hiking again. In the afternoon, as we were ascending to a monastery in the mountains, I saw a magnificent river carving its way through the landscape passionately. My eyes were drawn above it. Three hundred feet on a cliff, I saw an image of the Green Tara. I was awestruck by the shooting stars painted above her figure. For a few moments, I felt connected to the eternal. I felt my mother communicating with me, telling me that she would always be with me. On the evening I heard the shocking news of my mother's death, I stared at the sky hoping for an answer... a reason. Blazing through the Chicago night, I saw a shooting star... 'Mom'? That same evening, my older brother also saw a shooting star in the night, as he tormented over my mother's death. We both were moved to write and express this at her wake. 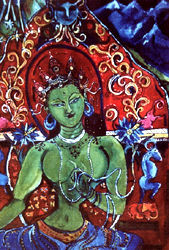 When I saw the shooting stars above the Green Tara, I knew that I was meant to be there at that moment in time. I felt my mother's love, and the warmth of her embrace. For a few moments, I felt that I was one with the universe, and that I would never be alone. The stars and the Green Tara embraced me. I was filled with peace and a sense of letting go. I knew this place was where my mother wanted her ashes to be united with the universe.